Windows Phone operating system feature neat virtual keyboard which support easy typing on touch interface devices. You can open and use similar virtual keyboard on Windows 8 operating system. Option to enable on-screen virtual keyboard is in-built by default in Windows 8 operating system. Following is easy routine to open on-screen touch keyboard on Windows 8. 1. 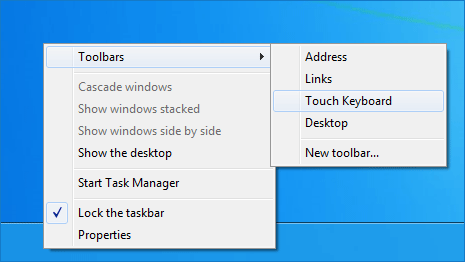 On Windows 8 desktop, right click on empty space on the taskbar and then goto Toolbars > Touch Keyboard option. You wll see new keyboard shaped icon on the right side of taskbar in the system tray area. 2. Click on the keyboard icon to open virtual on-screen touch keyboard. You should see full sized neat layout keyboard on the screen for easy typing. To close the virtual on-screen keyboard, click the keyboard icon in the system tray. Clicking same icon will bring virtual touch keyboard on the screen for quick usage.